President Barack Obama met with Democrats on Capitol Hill Wednesday to encourage them to talk up his signature health care law, the Affordable Care Act, just as Vice President-elect Mike Pence held a separate meeting with Republicans telling them that President-elect Donald Trump would be taking executive actions to dismantle the law. Members who were in the Democratic meeting said Obama urged lawmakers not to help Republicans pass a replacement plan and encouraged them to refer to any replacement as "Trumpcare." One member, said that Obama told them their job was to talk about the value the law has to the country and to focus the attention on the positive aspects. "The Affordable Care Act is more popular than President-elect Trump would like to believe," he said. When asked about Obama's intent to continue defending the law after he leaves office, the member replied that Obama has made it clear that he intends to be a private citizen. "Much of that is in our hands now," he said. "We are here." He continued: "The president said he was envious of us that we are still in the arena. I look forward to defending the Affordable Care Act." Obama wished members of the media a Happy New Year but ignored shouted questions about the impending meeting as he arrived at the Capitol accompanied by Senate Minority Leader Chuck Schumer, D-N.Y., and House Minority Leader Nancy Pelosi, D-Calif. His meeting with Democrats was closed to reporters and when he exited the meeting he declined to take questions, instead taking photos with junior staffers. Sen. Ron Wyden, D-Ore., spoke to reports after the meeting with Obama and called the reconciliation bill a "Trojan horse" that would result in tax cuts for the wealthy and premium hikes. Others agreed. 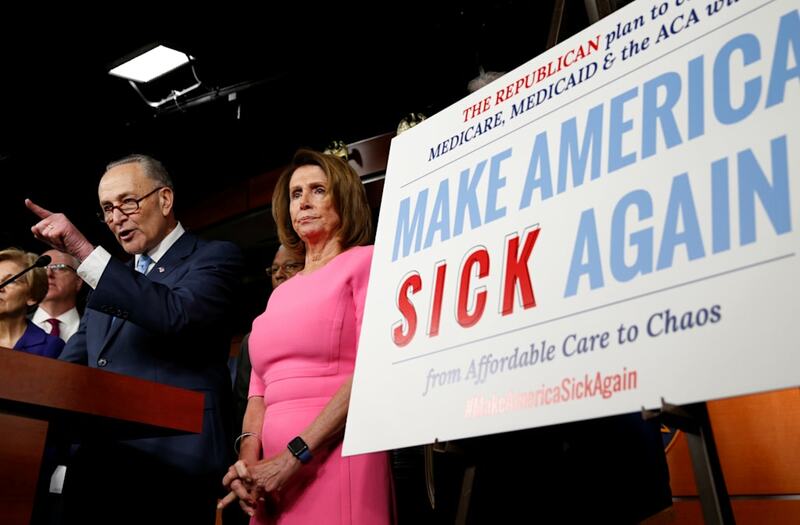 "The Republican plan to cut heath care wouldn't make America great again, it would make America sick again and lead to chaos instead of affordable care," Schumer told reporters. Rep. Elijah Cummings, D-Md., told reporters following the meeting that Republicans had no replacement plan. "The American people may want the law improved but the majority of them don't want repeal," he said. But Republicans have cast the law as a failed policy, saying that voters elected them specifically to repeal it. They have said that they need to fully deliberate on the details and get input from both sides before they can offer a plan for replacement. Repeal is already in motion. Republicans on Tuesday introduced a spending measure that will allow them to defund portions of Obamacare through a procedural tool called budget reconciliation, which requires approval of a simple majority rather than the 60 votes typically needed to pass most legislation in the upper chamber. Republicans plan to send the bill to Trump's desk by Feb. 20. "The American people voted decisively for better health care in this country and we intend to give them that," Pence said to reporters, adding that Republicans were working at a "two-track approach" to repeal Obamacare via executive orders and legislative action. He did not cite specifics about which portions of the law would be targeted, but said that the president-elect is "working on a series of executive orders that will enable that orderly transition to take place." "So much damage has already been done to the country," Speaker Paul Ryan, R-Wis., said. "Obamacare is a story of broken promise after broken promise." Ryan said Republicans would work to make sure "we don't pull the rug from under anybody" during the transition out of Obamacare and into the replacement plan. Donald Trump attacked the health care law on Twitter as the meetings were occurring. "Republicans must be careful in that the Dems own the failed ObamaCare disaster, with its poor coverage and massive premium increases like the 116% hike in Arizona," Trump wrotein a seriesof tweets. "Also, deductibles are so high that it is practically useless. Don't let the Schumer clowns out of this web... massive increases of ObamaCare will take place this year and Dems are to blame for the mess. It will fall of its own weight - be careful!"